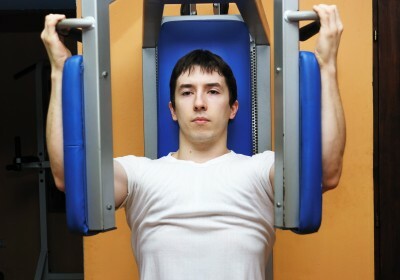 Strength building exercises have many benefits including weight loss and making the body strong. You may have any kind of health goals- strength training must be included in your exercise program. If you don’t know anything about strength training, it is best to get professional advice or a personal trainer for your needs. This would help you avoid any potential injuries. Here is a brief list of muscle groups with a few basic exercises for each group. As a beginner, you have to select just 1-2 for every muscle group. Selecting weight sets, and reps for strength building exercises can be a difficult thing to do. Basically, the number of sets and reps depend upon your goals. Use the weight that allows you to do only 1-3 sets of 10-12 reps. Take a break of 30-60 seconds between each sets, and take 1 day off between two workout sessions. Use the weight that allows you to do only 3-4 sets with 4-8 reps. Take a break of 2-3 minutes between each sets, and take 2-3 days off between two sessions. If you are a beginner, you should give yourself several weeks of conditioning before you try to weight train at a higher level. Use the weight that allows 1-3 sets with 12-16 reps. Take a break of 20-30 seconds between each sets, and take about 1-3 days off between two workout sessions. To find the right weight for your strength building exercises, start with a weight that is light enough to complete the required number of reps in one set. If you are able to do more than two reps more than the required number, then add more weight (2-5 lbs upper body, 10lbs lower body) to it until you can do the right number of reps. The last rep should be difficult but not entirely impossible, and you must always perform each exercise with good form through to the end. Make sure to warm up before each exercise. About 5-10 minutes of warm up sets or light cardio should be sufficient for it. Give yourself at least 1 day of rest after your first workout. Challenge your body- don’t kill it. After following the routine for a few months, you can change it to make it more challenging. From "Strength Building Exercises for Beginners" Back To "Faster, Stronger, Better – Your Shortcut To Improved Athletic Performance"